UK scientists have created the worlds first genetically modified chickens that do not spread bird flu.Writing in Science journal, the team says their work demonstrates it is possible to create a variety of GM farm animals resistant to viral diseases.The research team inserted an artificial gene into chickens; this introduces a tiny part of the bird flu virus into chicken cells.These birds become infected but render the virus harmless to other poultry.The team believes that the genetic modification they have introduced is harmless to the chickens and to people who might eat the birds. 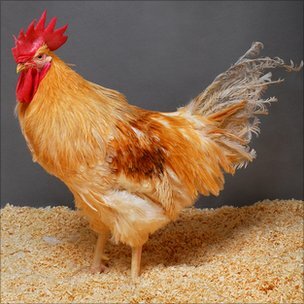 Now, they’re working on a chicken that can tell us which came first. via BBC News – Worlds first flu-resistant GM chickens created.